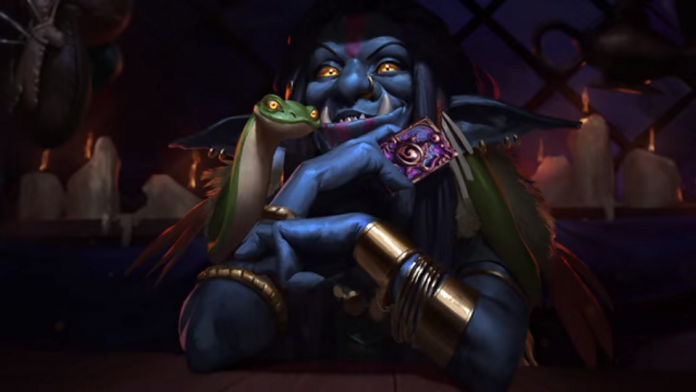 Another Hearthstone expansion is around the corner and, fortunately for me, Blizzard didn’t immediately reveal the entire set when they announced it. That means it’s time for another look into the future for the popular digital card game and all the eldritch horrors lurking within it. Hearthstone’s next expansion, Whispers of the Old Gods, will introduce 134 new cards to the game centered around four of the most ancient evils that plague the world of Azeroth. C’Thun, Yogg-Saron, Y’Shaarj, and N’Zoth are beings of such horrific power that even the fiercest villains that you’ve faced in your journeys through Naxxramas and Blackrock Mountain are trifling in comparison. Ragnaros and his fellow elemental lords were created by the Old Gods essentially to serve as action figures in their games of war, and the black dragon Deathwing that single-handedly caused the Cataclysm is like their adorable puppy. Even killing an Old God does almost nothing to quell its power, as Y’Shaarj has been raining mayhem across Pandaria for millenia using its final breath alone. Trying to kill the Old Gods is already an extremely bad idea on its own as many of Azeroth’s races, including dwarves and gnomes, are the result of the Curse of Flesh that the Old Gods cast when the world was young and breaking the curse would result in Azeroth’s destruction. Needless to say, the Old Gods are not to be toyed with and depicting them in our silly card game of robot clowns and grumpy poultry has probably doomed us all. Well, might as well have fun while we’re still alive and not sprouting tentacles everywhere! Our first card is the first of the Old Gods that World of Warcraft players came face-to-face with. The all-seeing C’Thun loves being the center of attention and has plenty of cultists to give it just that. 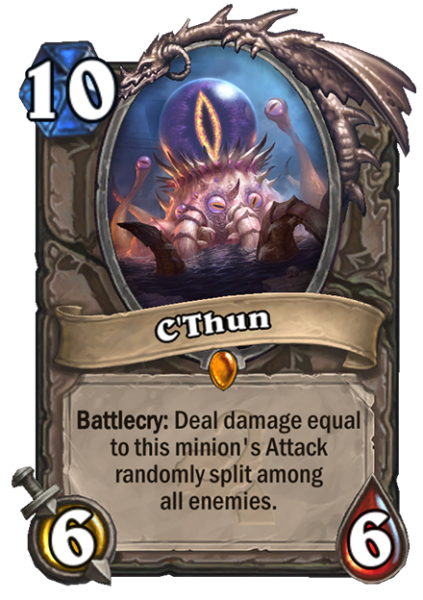 On its own, C’Thun is actually a really bad card with a weak stat-line and an underwhelming effect. Fortunately, it has plenty of worshipers that help make it significantly more potent. Cards like Beckoner of Evil and Twilight Elder will buff the power of your C’Thun, even if its sitting somewhere in your deck. 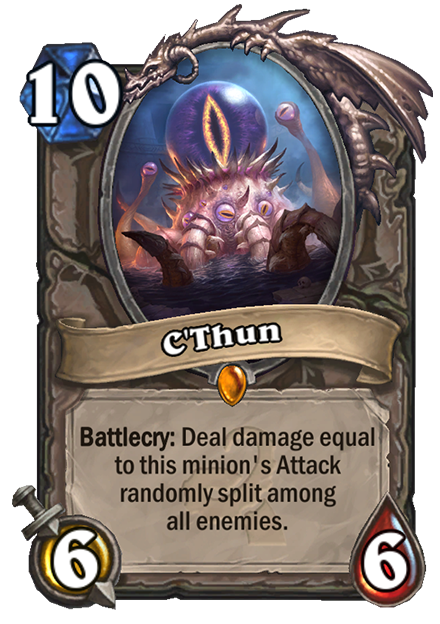 C’Thun definitely looks like a card designed for combo decks where the cultists control the early game and C’Thun comes in for the grand finale. Here’s a good example of what C’Thun’s worshippers are capable of. 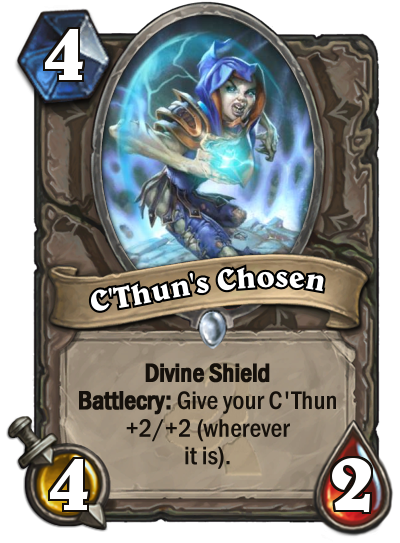 Even without her ability to buff C’Thun, a 4/2 with divine shield for 4 mana is very strong. Considering that Piloting Shredder is being rotated out of standard mode, C’Thun’s Chosen could be a suitable substitute and is playable even in a deck without C’Thun. The fact that C’Thun’s servants are serviceable without him is great news for Arena as drafting C’Thun in that mode is already going to be next to impossible and will only become more unlikely over time. Giving them good stats not only makes C’Thun decks more viable, but it also prevents Arena from being flooding with garbage over this one expansion. The Old Gods are well known for their corrupting influence, and many familiar cards are going to have twisted reimaginings introduced. One example is the bane of every new Alliance player, the gnoll gangleader Hogger, being mutated into the monstrosity pictured above. The corrupted Hogger certainly has better stats than the vanilla version that we’ve had since Classic, but his effect is now much less reliable. However, the Doom of Elwynn could serve as a counter to C’Thun. Not only could he tank a large chunk of C’Thun explosive entrance on his own, the additional gnolls he summons would also absorb a lot of the damage. That said, I can’t help but feel that the Grim Patron card already does that job and does it better. 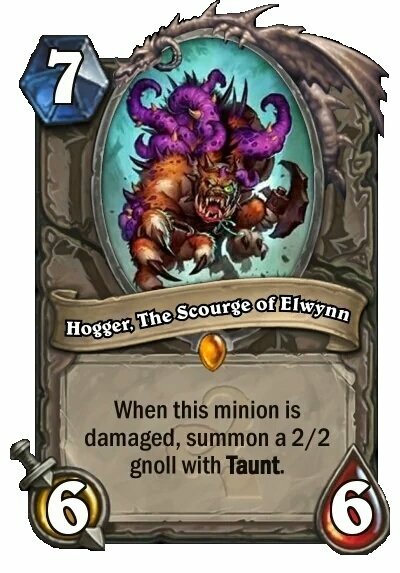 Maybe a new Patron Warrior deck will find space for Hogger, but he’s currently one of the least promising new cards. For the record, these corrupted cards are going to be their own thing and won’t replace the existing ones. You can run both the corrupted Hogger and the original one in the same deck. One new set of cards that WotOG will introduce is the Forbidden Spells line. All nine classes will receive one Forbidden Spell, and each will have their level of power based around the amount of mana you currently have available. While they all cost zero mana on the surface, they actually spend all of your remaining mana crystals and will have a greater effect with the more mana you spend on it. I see a lot of potential in these cards already as they’re highly flexible and you can get exactly the amount of mileage you need out of them. Only three have been revealed thusfar, but I already expect that several of the Forbidden Spells will become mainstays in a lot of future decks. 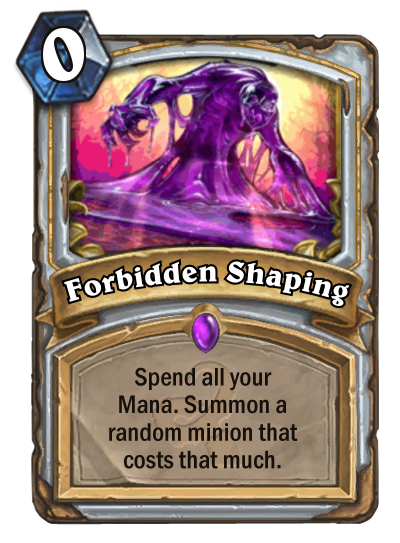 Paladins will get a healing spell and mages will be able to deal spell damage to a minion, but the one that’s captured my attention the most is Forbidden Shaping for priest. Granted, there is a lot of randomness involved in what you’ll get out of the card and there’s a good chance that you’ll get stuck with a weak battlecry minion like Faceless Manipulator after spending most of your mana. However, I feel like the amount of flexibility that it gives your deck may just be worth taking that risk. No matter what point in the game you draw it, it guarantees you a minion that you can play on curve. You can even play it for zero mana for a Wisp if you’re especially desperate to just get another body on the board. It’s certainly something I could recommend in an Arena draft, though even I’m not sure what kind of constructed deck it could actively benefit. On a final note, I’m very curious to see what Druids are getting as their use of mana has always been crazy. 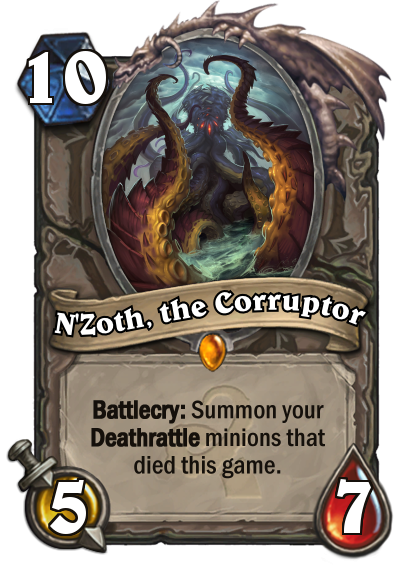 N’Zoth is the most mysterious and possibly the most powerful of all of the Old Gods. Little is known for certain about this reclusive horror, but there are countless rumors of its influences. One example is that the corruption of Deathwing is believed to be its doing. N’Zoth has yet to actually appear in World of Warcraft and it seems that Hearthstone has received the honor of revealing its true form to the world. That, or this is simply Innkeeper Stonebrew’s personal interpretation of the creature (or Tysmurph’s interpretation since he actually did the art for the card, but I’m roleplaying here) and the real N’Zoth remains to be seen. While N’Zoth’s stat line is fairly poor, its effect easily makes up for it. As Curse of Naxxramas has shown, deathrattle minions are some of the most powerful in the game and filling your board with them is insanely good. N’Zoth definitely looks like it will be one of the new high-level legendaries and can benefit almost any deck. The fact that it doesn’t die to Big Game Hunter is also a bonus. There are just a few things to keep in mind to get the most out of it. For one, it can only summon minions that natively have deathrattle, so cards like Unearthed Raptor and Explorer’s Hat won’t interact with with it. Second, while I don’t know exactly how the card is designed, I assume that it will prioritize minions based on the order they died. That means that your stronger deathrattle minions like Sylvanas won’t be summoned because you played too many smaller ones like Loot Hoarder early on. Still, a board full of deathrattle minions is nothing to sneeze at. The last thing to keep in mind is that aggro decks exist and will shut this down hard. That will be enough to cover for now, but there are still plenty more exciting cards left to look over. Next time, we’ll look at a card for warlocks who are sick of being warlocks, new legendaries for shaman and priest, and more.